Discover the creative art of Eco Printing! Spend a day playing with leaves and flowers learning to capture the unique qualities of plants on silk and cotton. 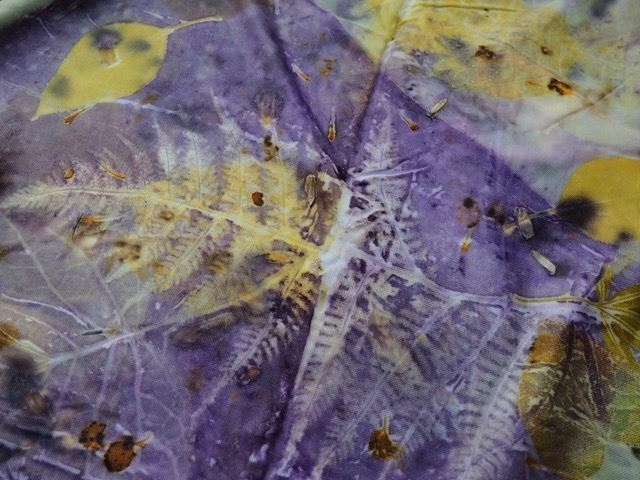 We will use natural dyes and plant materials to make a lasting print on silk scarves and cotton dinner napkins. Learn how to prepare your fabrics, what plants produce dyed prints, and how to print with those that don’t during this relaxed day of encouragement and fun. Herbal tea, made from some of our favorite dye plants, and all dye materials will be provided. Celebrate Fall and its colors through eco printing. Materials Fee: $30 for two - 14" x 72" 19.5mm Silk Scarves, 4 - 20" x 20" Cotton Dinner Napkins (all scoured and pre-mordanted) for students to eco print and take home. Also supplied will be plant and natural dye materials (though we may forage for some, too), herbal tea, and class handouts.